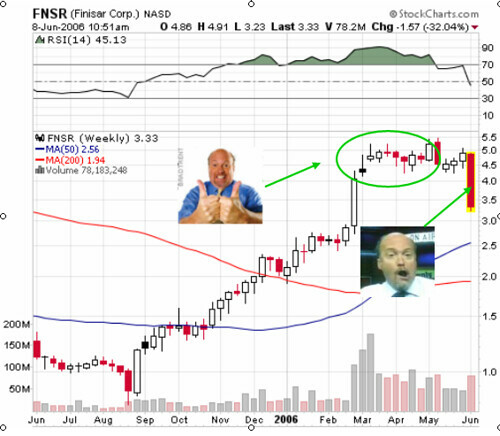 Finisar Corp (FNSR), which is a good company, reported earnings last night. If you looked at the release without ever knowing the stock performance for the last year, your conclusion would be overwhelmingly positive. Yet the speculators who have piled into the stock didn’t like the gross margin outlook, lack of a penny here or there, and the blood runs in the streets from the guillotine working overtime. This is sickening and an awful indication of the investment environment surrounding this company. I think this event will finally force rationality into the optical market. It’s something I have been looking forward to because it lets my strategy and thinking work. I have no ability to outperform a mob. You can read more of my thoughts on my industry model and where Finisar fits here. I bought the stock with the intentions of reaping some funds from the hard work, and productivity that the personell at FNSR had achieved over the last period. I believe that the earnings posted, were sincere, and uplifting, but the patients are running the asylum. Where do we go from here if a company with great earnings, and growth, make the stock tank??????????????????????? Hi, appreciate your work here. Agree basically that Finisar was a speculators darling the last so many months, but it’s also worth noting that on the Monday before earnings release Infineon announced it was selling the 24 million shares they received as part of of Finisars purchase of their optics business. This undoubtedly explains some of the extreme downward pressure. Steve.